Taille de cet aperçu : 598 × 600 pixels. Autres résolutions : 239 × 240 pixels | 479 × 480 pixels | 766 × 768 pixels | 1 021 × 1 024 pixels | 1 364 × 1 368 pixels. 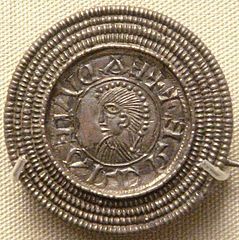 English: An Anglo-Saxon coin brooch (silver), dated c. 920, imitating a coin of Edward the Elder. Discovered in Rome, now in the British Museum. Ce document provient de « https://fr.wikipedia.org/wiki/Fichier:Edward_the_Elder_coin_imitation_silver_brooch_Rome_Italy_c_920.jpg ».